Stossel also argued that government deserves less credit in reducing workplace accidents through OSHA than it might try to claim since workplace deaths were already decreasing before the agency was formed. Stossel: "Your faith in OSHA is like a religious belief. Look at this chart. 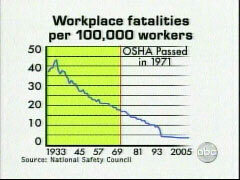 This shows workplace injuries since OSHA was passed. Yes, going down. But look at it before OSHA. Things were getting better anyway. It's like government gets in front of the parade and pretends it's leading the parade."